Larian shows off some of Divinity's cut content. Fort Joy, Driftwood, and Arx were once connected. A lot went wrong during the development of Divinity: Original Sin 2. In the end, it was hard to tell: Larian's RPG was our 2017 game of the year, and is one of the deepest, most enthralling RPGs in years. But in a GDC panel last week, Larian founder Swen Vincke went over the challenges his team faced during development. It turns out writing a massive and extremely open-ended RPG is pretty tough. 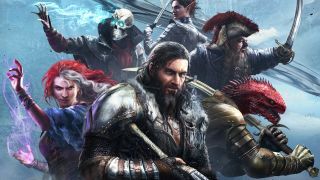 Vincke talked in detail about working out the writing process for Original Sin 2, issues with game balance, the controversial armor system, and other issues they ran into. The most interesting detail to me was the world Larian had initially planned for OS2's multi-act structure. In the finished game, Act 1 takes place on the prison island of Fort Joy. It's a huge sandbox, dense enough to last for 20 or more hours of adventuring, with multiple avenues to eventually win your freedom. Act 2 takes you to the mainland and another large area called Reaper's Coast. In Act 3 you travel to the Nameless Isle, and in Act 4 you're mainly in the city of Arx. The original plan, though, called for all of these locations to be connected on a huge world map. Here's a picture of that map from Vincke's talk. But that's not the really crazy part: This wasn't even going to be the only map in the game! "Once we started realizing that we were in trouble and that we weren't going to be able to make everything that we planned on, we had to make cuts," Vincke said. "Originally Original Sin 2 had a map for the human lands, one for the dwarven lands, one for the undead, basically for each of the races present in the game. What you're looking at here is a map of the human lands, which contains the city of Arx, Driftwood, and Fort Joy, all on one map. Which is essentially the entire game. That gives you an idea of the level of cuts that we had to do." Each of the major playable characters in Original Sin 2 has a lengthy origin story that ties into their questlines throughout the game. Those origin stories were originally going to be depicted in locations in those characters' homelands. "Each of these maps had a lot of action going on, and when we cut it, we suddenly started cutting into what was supposed to be the real estate for the origin stories," Vincke said. "So that meant that we had to go and change our origin stories again. This constant ping-ponging between adapting to the fact that we were going to be late and having to make cuts had an impact on the story. The fact that it had an impact on the story meant that the rest of the production was going to be delayed. We struggled quite a lot with that, but eventually managed to have it under control." Every game ends up with cut content during development, as the realities of what can be done in time and on budget rarely line up with early plans. Even without those other maps, Original Sin 2 is a massive game. It took me 104 hours to finish a single co-op playthrough, and I could easily play it two more times to see the many paths I didn't take. But it is cool to think about how different the game would've been with a single unified map for the human lands, and how that would've impacted its multi-act structure. I think it ended up for the better—being able to go back to previous areas would be cool, but making them reactive to changes later in the story would've been an impractical amount of extra work.